The National Secular Society wrote to Amazon twice asking for the kits, modelled on a child under two, to be “permanently removed from sale” and warning unnecessary surgery could lead to serious harm. 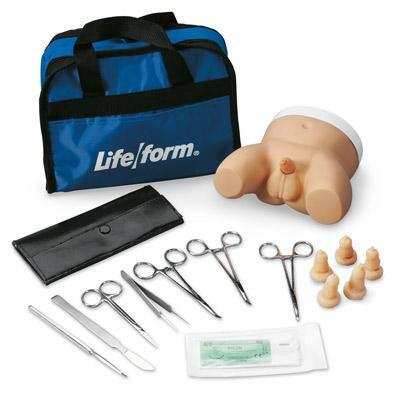 Life/Form Circumcision Trainer kits, including surgical scissors, scalpels, a practice dummy with prosthetic foreskin replacements and instructions, were on sale for between £365 and £456, but were removed after an enquiry by The Independent. However cheaper versions of the kits, including the dummy training doll and foreskin replacements, were still listed at time of publication. It warns that a complaint to the the UK Advertising Standards Agency could follow about the health benefits claimed. Well gee with that kind of success it’s probably just a matter of time before mandatory medicine metastasizes into ADULT male genital mutilation, as random-junk-contaminated corporate-liability-immune vaccination currently threatens to do. It would have to be imposed behind closed doors though, the sight of grown men being tied down and struggling against armed guards, doktors and nurses would be a little too disturbing to the sheep. Better to get them before they can make a scene. What the media never seems to get around to mentioning is that MGM INCREASES male-to-female hiv transmission rates by more than enough to neutralize the purported reduction in the opposite direction. Nothing to see here.